WhatsApp 'Delete for Everyone' is easy to use. Just keep in mind you can recall messages within seven minutes, and no longer than that. WhatsApp’s ‘Delete for everyone’ was anticipated for quite some time now. WhatsApp has officially rolled out ‘Delete for everyone’ feature globally for Android, iOS, and Windows users. It lets people delete sent messages, including media within seven minutes of sending them. For ‘Delete for everyone’ to work, both sender and recipient must be using the latest version of WhatsApp app. The feature is quite useful when it comes to recalling messages that contain a mistake, have been accidentally sent, or were meant for someone else. It works for individual as well as group chats. WhatsApp ‘Delete for Everyone’ is easy to use. Just keep in mind you can recall messages within seven minutes, and no longer than that. Both recipient and sender will get a notification when messages get successfully deleted. However, people won’t be notified if deleting message for everyone was unsuccessful. In this case, the receiver might see or read your message. “Messages you successfully delete for everyone will be replaced with “This message was deleted” in your recipients’ chats (*). 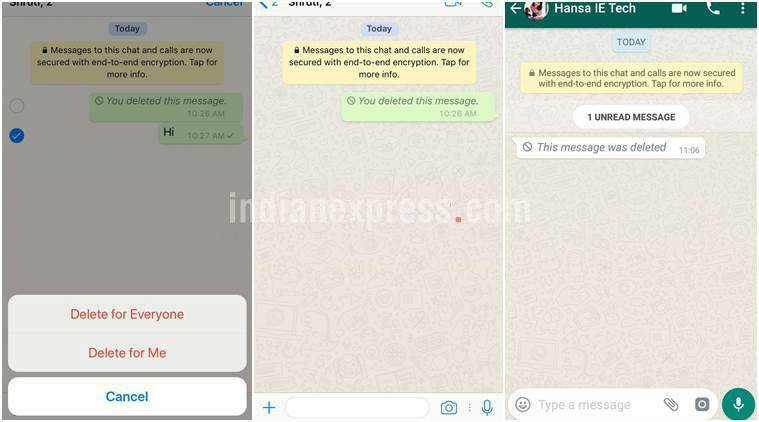 Similarly, if you see “This message was deleted” in a chat, it means that the sender deleted their message for everyone,” read WhatsApp blog post. WhatsApp’s ‘Delete for everyone’ was anticipated for quite some time now. The Facebook-owned company was previously testing the feature, and it was said to remotely enable it for users. Deleting message for everyone should come as a relief to people who have a habit of mistakenly sending messages to wrong contacts when in a hurry.